“This is a great occasion. There will never be another one like it in all of the history of Australia,” President Gordon B. Hinckley, Second Counselor in the First Presidency, told Saints gathered in Sydney September 20 at the dedication of the first temple in their country. “There will be other temples here as the Church grows in this vast land,” he told members attending the first of fourteen dedicatory services for the Sydney Australia Temple. Then he continued, “This marks the dawning of a brighter day for the Saints of Australia, those present and those yet to be. In the dedicatory prayer, President Hinckley spoke of “hearts filled with thanksgiving on this day when we dedicate thy holy house. “We thank thee for the strength of thy work in this great nation of Australia, for the hospitality accorded thy servants who have come here over a century of time to teach thine everlasting gospel, for all who have received it, and for the confirming witness of the Holy Spirit in their hearts. Other speakers at the dedication included members of the Quorum of the Twelve and D. Arthur Haycock, secretary to President Spencer W. Kimball. The second of his themes was prayer. He admonished the Saints to pray constantly, telling them that they cannot pray too often. Also speaking at the services were Bishop H. Burke Peterson, of the Presiding Bishopric, and Elders Wm. Grant Bangerter, Devere Harris, and Philip T. Sonntag of the First Quorum of the Seventy. The temple is located in Carlingsford, nineteen kilometers (almost twelve miles) northwest of Sydney’s center, on the same site as the Church offices in Australia. Behind the temple, to the west, the land drops away to lush, green playing fields and plains, with the beautiful Blue Mountains about forty kilometers (nearly twenty-five miles) away. There are huge eucalyptus trees in the distance, and several on the site. Thousands of Australians were drawn to tour the temple during the open house period before its dedication. Hundreds requested more information about the Church. Many were affected by the temple’s beauty and the spirit of peace and reverence they found there. Most of the workers on the project were non-LDS, and many were curious about the temple. They turned to Brother Frank Hewstone, the Church’s project representative, for answers; frequently when he attempted to answer a worker’s question, there would be a group around before he was finished. If the temple was impressive to those outside the Church before its completion, it was even more so when it was finished. Visitors seemed not only to feel the spirit of peace that was there, but to be moved to action. One young couple in their twenties approached a guide after touring the temple and asked where they could join the Church. A Seventh-day Adventist minister who took the tour seemed very friendly, asking “a million questions,” the guide recalled. Then the minister explained that he had been interested in genealogy for many years and had collected some three thousand names of members of his family. Would the LDS Church be interested in them? 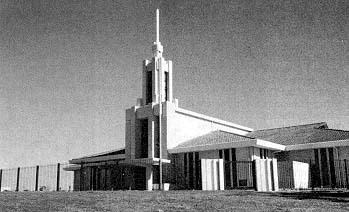 The Sydney Australia Temple, new landmark in suburban Carlingsford. Sister Bakker is a member of the Greenwich Ward, Sydney Australia Greenwich Stake, and public communications director for the Sydney Australia Region.